The tradition of baptizing infants soon after birth arose during a time of high infant mortality. Episcopal baptism is the initiation by water and the Holy Spirit into the church. The person being baptized promises, or in the case of an infant has promises made for her, to renounce evil and embrace God. The ceremony is also a time for family and friends to welcome a person into the church. The Episcopal, or Anglican, baptism is a time for parents to dedicate themselves to raising their children as Christians or for adults to dedicate themselves to Christ. It is considered one of two major sacraments, along with Eucharist. Episcopalian baptisms take place on or near one of the four feast days that relate to baptism. These include All Saints Day, the Baptism of Jesus, Easter and Pentecost. 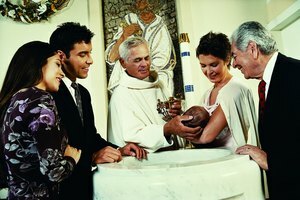 The Episcopal church follows the Christian tradition that baptizes infants. The baptism ceremony includes a liturgy of promises to renounce evil and accept God. 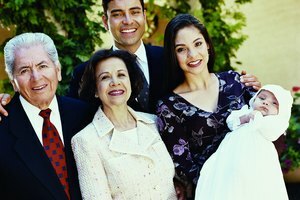 The infant's sponsors, generally parents and godparents, make these promises on behalf of the child. 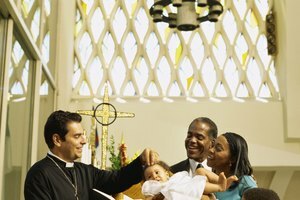 Infant baptism ceremonies are held in front of friends and family, and are not generally private affairs. Water is sprinkled on the infant's head in the name of the Father, the Son and the Holy Ghost. Episcopalians believe that a person need only be baptized once in his life, so there are other ceremonies (confirmation and reaffirmation) that allow older children and adults to strengthen or restate their faith. An older child or adult who has never been baptized attends preparation classes prior to their baptism, to make sure they understand the promises they are making. They require sponsors, who make promises to help the person being baptized grow as a Christian. Older children and adults may be fully immersed in water or have water sprinkled or poured on their heads. Sprinkling or pouring water is most common in the Episcopal church. Baptism in the Episcopal church requires a sponsor. The sponsor should be a baptized Christian who attends church and is willing to enter into a long-term relationship to help the person being baptized understand the promises made on her behalf. It is recommended that at least one man and one woman, in addition to the parents, be chosen as sponsors for infant baptisms. For older children or adults, it is traditional for the sponsors to be two members of the opposite gender and one of the same gender as the person being baptized. Alburger, Shaunta. "Episcopal Baptism Ceremony." 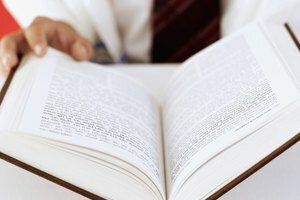 Synonym, https://classroom.synonym.com/episcopal-baptism-ceremony-12085158.html. 29 September 2017.